It would be impossible to present the entertainment at Moisture Festival without the help of our fantastic volunteers. With each great show there are important jobs that must be done to make sure the show runs smoothly and that the audience is happy. We all have a lot of fun together, mainly because we have been so fortunate to have a diverse array of talented individuals to who donate their time and energy. The 2019 festival will take place March 14 through April 7, 2019. We will begin signing up volunteers in February 2019 but join our Shiftboard now to make sure you receive all the latest updates and announcements. 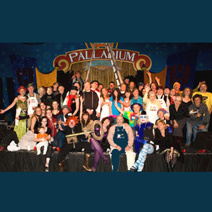 Volunteering for Moisture Festival, you can help build sets, create the Palladium, meet and greet the public, help in the office, clean and sweep, take tickets, feed the artists, work backstage, provide security, and the list goes on and on. The festival is fueled by over 250 volunteers filling over 1500 shifts equaling over 5500 hours, so we need you! Almost everyone involved in the festival is a volunteer, from the producers to the Doors Teams to our Ground Transportation Drivers. We all work together to make this festival happen. Many of our volunteers have been with us for years – and they keep coming back to work for free because they love the festival. Our shows run Wednesday through Sunday. Most of the shows are held at Hale’s Palladium in Fremont, but many shifts are also at other venues around Seattle. If you are available for daytime work or pre-festival work and would like to help with administrative, publicity, theater construction or decoration tasks, please let us know! If you have experience programming for Filemaker, we would love your assistance to improve our database! We welcome the guests, keep them company while they wait in line outside the theater, take their tickets as they enter and help them to find seats, as necessary. We are the face of the festival and the beginning of the show. Costumes are encouraged and playful attitudes are a must! Everyone helps with setting up the theater and cleaning up after the show. Our security crew is primarily there to keep everyone safe and happy. Our security is very light, because our audiences are fantastic. Security/Safety people help with the set-up and clean up of the theater, and are stationed both outside the theater and inside before the show. During the show, security volunteers are stationed throughout the theater and the brewery. Security volunteers help with setting up the theater and cleaning up after the show. We run an onsite box office at every show, both selling tickets for the current show and handling the will-call list from advance ticket sales. If you have box office or cash handling experience and work well with people, this may be the job for you! Unfortunately (and fortunately) we have many sold-out shows, so we have often have to be the bearer of bad news to walk-ups. We aim to do it with grace and style. Warm costumes are encouraged – our box office is in a gypsy caravan outside the theater. The box office volunteers are responsible for setting up and shutting down the box office. If you have experience as a stage hand please drop us a line! We have an ever-changing lineup with frequent last-minute additions/changes. We will keep you on your toes with glee! Help with the care and feeding of artists in the Green Room. One of the greatest joys of the festival is the gathering for dinner at the end of the show – we make it happen. Help set up the Green room and keep it stocked with snacks and drinks during the show, and prepare for, serve, and clean up after the meal. You’ll be everyone’s favorite! Our Hammerheads literally ‘make art work’, building sets, decor, theater improvements, etc before the festival. Being a Moisture Festival volunteer driver is a great way to meet interesting and talented people, make new friends and really help the Moisture Festival show some Moisture Festival and Northwest hospitality to arriving out of town performers and staff. The Moisture Festival needs drivers to pick up and drop off performers and out of town staff at the airport, or transport performers and staff around town. Basic Requirements: Drivers license, vehicle in safe working condition with insurance, working cell phone, vehicle able to accommodate passengers and baggage, ability to be flexible, working email address, knowledge of greater Seattle area. *Most volunteer roles are completely volunteer and do not receive tickets to attend shows. You do get the watch the show(s) you are working and enjoy a hot meal with the artist and your fellow volunteers at the end of the night. The only roles that receive compensation in the form of complimentary tickets are roles that do not take place during a show such as airport driving, pre/post-festival construction, and office work. *On Friday and Saturday nights, one shift covers both the early evening (7:30pm) and late night (10:30pm) shows. It’s a long night, but we always have so much fun together. All other shifts cover only one show. Most volunteers help with the daily set-up and clean-up for each show. We make sure the theater is set and stocked, prepped for aerial acts and special performances, and kept sparkling. * No matter what volunteer team you are on, please come wearing something you can push a broom in. You can change into your festive duds before the show. * You may be asked to help in an area other than the one you signed up for, especially if we are over or under-staffed in a specific area. We all pitch in where we can, so please be flexible! * Volunteers ahould arrive 90 minutes before show time to check in with the on-site volunteer coordinator, meet their volunteer leads, and be assigned to your tasks. * When you arrive for your shift, please check in at the volunteer desk immediately inside the theater. You will need to read and sign the volunteer agreement/waiver, which will be provided by the on-site volunteer coordinator. * We have a space where volunteers are able to stash their personal items while they work. * Our volunteers work hard, but are able to watch most of the show. Although you are able to see most of the show, you are still “on duty” – please remain where the volunteer leads can find you, and be sure to check in periodically. * Volunteers are welcome to join the cast for a hot dinner after the show (or between shows on Fridays and Saturdays), but are not permitted to go backstage during the show, or after the show until the theater is cleaned and set for the next show. Space is very limited backstage, and performers need the area to dress, warm up and prepare for their acts.